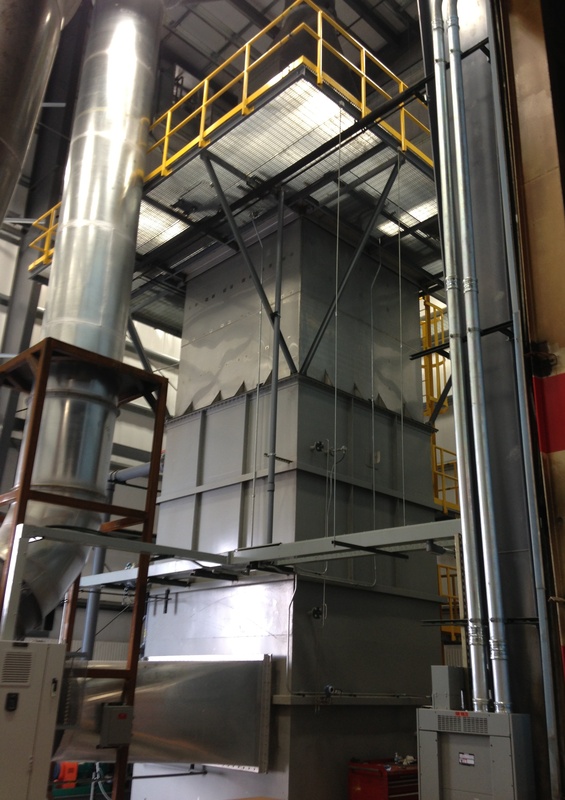 Envitech’s wet electrostatic precipitator (WESP) uses electrostatic forces to remove particulate. It is used to treat gas streams with sub-micron particulate, aerosols, or fumes. These can include heavy metals such as lead, arsenic, or cadmium, condensed acid aerosols like sulfur trioxide (SO3), or condensed volatile organic compounds (VOC’s). The use of electrostatic forces minimizes energy costs compared to Venturi scrubbers or baghouses, which require large amounts of energy to overcome resistance to air flow. Wet electrostatic precipitators are used in a wide range of applications including, hazardous and medical waste incinerators, metals refining, sulfite pulp mill recovery boilers, copper roasters, sulfuric acid plants, and wood dryers including oriented strand board (OSB), medium density fiber board (MDF), or pellet mill dryers. Particle collection occurs in a collector section which consists of an array of grounded tubes and high voltage discharge electrodes. A high voltage is applied to the discharge electrodes to both charge the particles and provide a high voltage field. The voltage on the discharge electrodes creates a corona discharge of electrons from high intensity ionization disks on the electrodes. This geometry concentrates the charging field in the zone between the disc and the collection tube. This disk-in-tube geometry allows for the formation of a stable, intense, electrostatic field for particle charging. As the electrons move from the discharge disk to the collector tube, some of them intercept particles in the gas stream which charges the particles. Once the particles are charged they move across the gas stream by the high voltage field where they deposit on the grounded collector tube. The particles are then intermittently flushed from the collector tube with a stream of water. The Envitech Wet Electrostatic Precipitator can be designed for gas flowing through the collector section in either a down-flow or up-flow configuration. 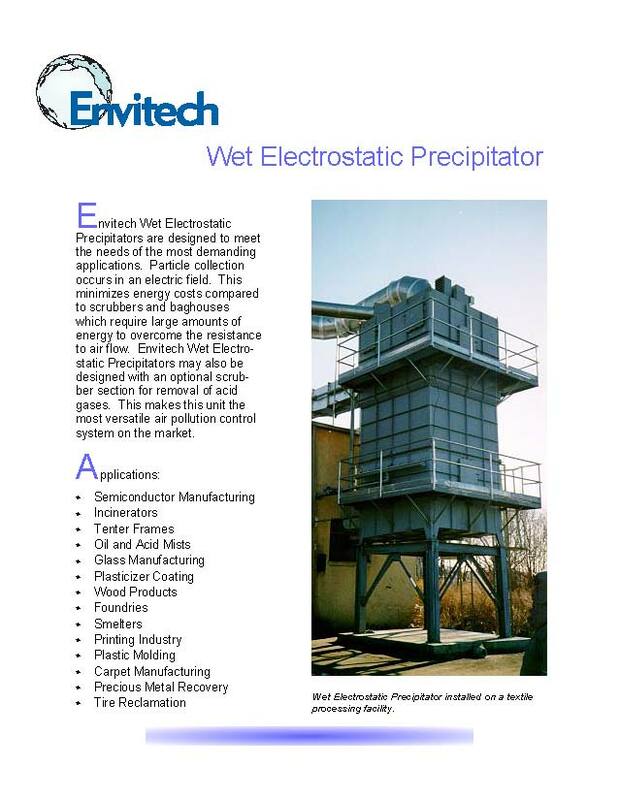 The Envitech Wet Electrostatic Precipitator is a proprietary, robust design. It has a unique alignment mechanism to hold electrodes rigidly in place. This reduces installation and maintenance time and improves performance. The field strength is consistently maintained at high levels with minimal sparking, resulting in the highest available efficiency. The greater the electrostatic field strength, the greater the particle migration velocity (velocity component towards the collection tube). Increased migration velocity achieves higher particle collection efficiency with a lower specific collection area (SCA, collection area per flow rate) than conventional precipitators. Lower SCA means a smaller, less expensive unit. Envitech's Wet Electrostatic Precipitators may also be designed with an integrated packed bed scrubber section for acid gas removal. 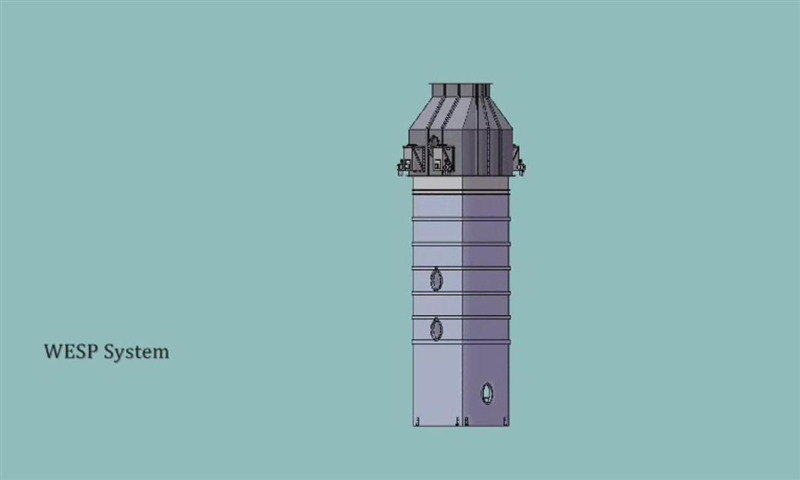 This makes the unit a versatile, multi-pollutant system which has demonstrated proven performance for meeting the most stringent emission limits encountered in industry today with the smallest available footprint.